Living in a place teeming with colours positively impacts your mood, provides inspiration, makes you smile and boosts your energy. Kolorowy Gocław is a housing estate comprising six modern and meticulously designed residential buildings with commercial units on the ground floor and underground car parks. 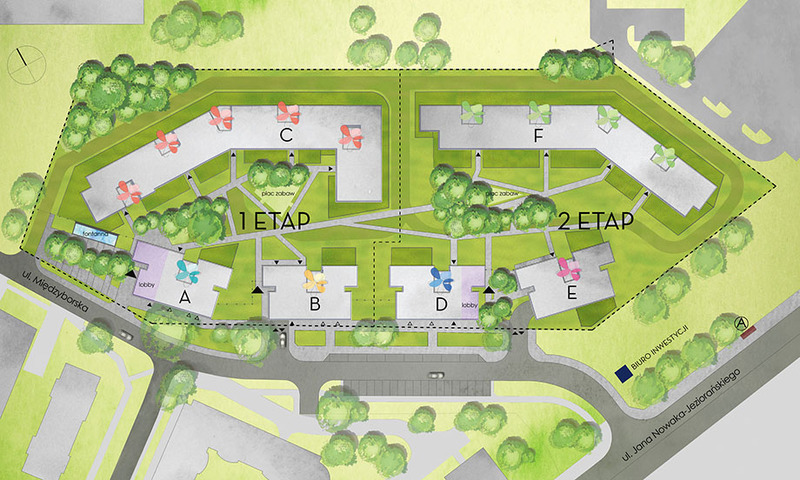 The estate has been divided into two phases. The buildings were arranged in a way which allows to create internal patios for the residents, with interesting layout of recreational areas, playgrounds for children, an optimal communication system and beautiful harmonious green areas. Although it has been divided into two phases (due to functional reasons), the entire scheme is consistent and creates one homogeneous structure, which nicely fits with the surrounding neighbourhood and increases its value. Each of the two parts of the estate will have a separate main entrance with a spacious and nice-looking lobby and reception area. Kolorowy Gocław housing estate is situated in a quiet and attractive part of the district, at the intersection of Międzyborska and Jan Nowak-Jeziorański streets. The project’s best features include surrounding green areas, proximity of extensive infrastructure, large shopping centres (such as CH Promenada) and entertainment facilities. Unlike other new housing estates in the area, Kolorowy Gocław will be surrounded by small and low apartment buildings. Excellent communication with other parts of the city is possible due to proximity of arterial roads: Ostrobramska, Aleja Stanów Zjednoczonych and Siekierkowski Bridge. In addition, bus stops are located on the streets surrounding the estate. In partnership with Urzadzamypodklucz.pl, we offer you a turnkey interior finish program. Our offer covers the design, procurement and transport, coordination of fit out works, cleaning and interior arrangement. You get keys to your ready to move in apartment. Delivered at the agreed time and with no surprises in the budget. Benefit from an offer dedicated to Yareal clients !